It may sound bad, but at least it's better than last year. Everything's going swell over at the House of Mouse, with all divisions reporting profits ... well, all except Disney's game division. A $54 million loss has been attributed to its woefully performing game unit. Still, there is some small reason for hope: $54 million may seem like a lot of money but, compared to the game division's $70 million loss in the previous financial year, it's really not that bad. In fact, it's $16 million better, which can be attributed in part to happier times at Disney's Japanese mobile game studios and fewer expenses generated by its social gaming unit. The interactive division bumped up revenues by 8% thanks in no small part to these factors. 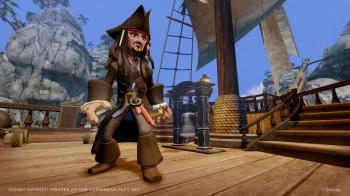 Meanwhile Disney Infinity launch delays will keep the game unit's anticipated operating loss at pretty much the same level in the coming financial quarter. In Disney's Shareholder Letter published January 2013, CEO Robert Iger said that 2013 would be a good year for the company's online presence, "as we reinvent the way video games tell stories" with Infinity. Presumably Iger is also hoping it will reinvent his game division's bottom line.